Back in the day, taverns weren't just cozy bars with quaint names, they were rough and tumble places! And that's why every tavern needed a fair maiden. She'd be there not only to sweep up the filth-strewn straw and collect the silver for the drinks but to add an air of civility to the atmosphere. She'd encourage people to sing a distracting ditty before two burly knights could challenge one another to a duel over who got to sit on the stool with four legs. She'd usher the local well-loved outlaw out the back door just as the Sherrif sauntered in. This is all to say, the simple tavern maiden is the Meddeival diplomat! You'll look the part when you're wearing this sassy costume. Perfect for plays, Rennaissance fairs, and costume parties alike, this costume is the perfect balance of sweet and salty! The skirt has two layers with an olive green and maroon striped underlayer and a fresh green overskirt that hits at mid leg. The included black belt can cinch up your skirt for easy manuvering. Your look is topped with the off-shoulder peasant blouse and faux leather corset with cream-colored ribbons. Whether you're serving nobles and peasants, we're sure that they'll appreciate your perfect pours. 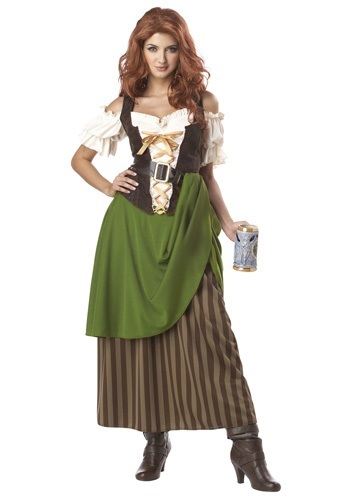 Par this look with a beer stein and wig to make your transformation complete. You'll be glad you outfitted yourself with this classic look at the Renaissance festival or for your next costumed event. Just remember, you're an essential part of the tavern experience!